An elementary idea of courts in Bangalore is a must for anyone who wishes to be a part of the city for a short or long duration of time. This idea about judicial forums shall go a long way in swiftly obtaining legal solutions to complicated problems of daily lives. This article provides a brief glimpse into some of the important courts in Bangalore, along with providing the pertinent information concerning their functions. Consumer grievances and disputes are specifically taken up in these special purpose courts in Bangalore, which have been established by the government with the sole purpose of safeguarding consumer rights against the malpractices of sellers. A consumer, on being harassed or exploited by the seller, can file a case against him in the consumer court; however, the filing of such a case requires the consumer to submit all necessary documents that can prove that his grievance is a genuine one. Such proof generally comes in the form of bills or receipts which can testify the validity of the transaction between the buyer and the seller. Without such documents, the consumer’s case may not hold water. Sometimes also referred to as the industrial tribunal, this is the judicial forum in Bangalore that deals with employment or labour related issues. To give more time, space and patience to the marginalized working classes and listen to their problems with more empathy, the government has set up these courts in Bangalore, which are meant to expedite the process of mitigating tensions and settling disputes that emanate from labour and employment. This has, to a considerable extent, ensured that the grievances of those in the lower rungs of the society, get heard by the judiciary. Whenever any issue related to family laws comes within the ambit of the judiciary, it is referred to this court, which concerns itself with hearing matters pertaining to family problems (such as the custody of children, validity of marriage and matrimonial status of an individual); at times, these courts also take up divorce-related matters. Mostly, these courts in Bangalore come into effect when matters falling expressly within their domains are referred to them by higher courts in the state or nation. The main objective of this kind of court is to provide speedy delivery of solutions to problems that are inherently concerned with interpretation of family laws and regulations. It was in 1984, with the enactment of the Family Courts Act in India, that these courts came into existence and subsequently offered tremendous help to the overloaded higher courts all across the country. This belongs to a certain category of courts in Bangalore which have been set up to disseminate the functions of the judiciary across multiple strata. These courts deal with matters only at a district-level, but their decision making is under the ‘appellate jurisdiction’ of the high court of the state of which the district is a part. In India, generally, the District and Sessions Judge is appointed as the highest judicial forum in a particular district. Both criminal and civil matters are heard by these courts and their decisions are subsequently referred to the high courts for ultimate approval. This is of enormous help to the judicial system in Bangalore, for the courts not only reduce the workload of the high court drastically, but also simplify its process of decision making. This court handles all disputes arising out of civil matters, thereby not taking up cases involving the interpretation of criminal laws and trials. The individual who raises an issue in the civil court is called a plaintiff – he usually makes claims of having suffered losses due to irresponsible behavior or actions undertaken by someone else; this target entity, against whom the plaintiff registers his complaint is called the defendant. Following the filling of the complaint, the plaintiff generally makes claims of having his losses reimbursed by the defendant, by legal means. This entire set of claims and complaints, brought about the plaintiff in a city civil court, is defined by the term ‘lawsuit’. 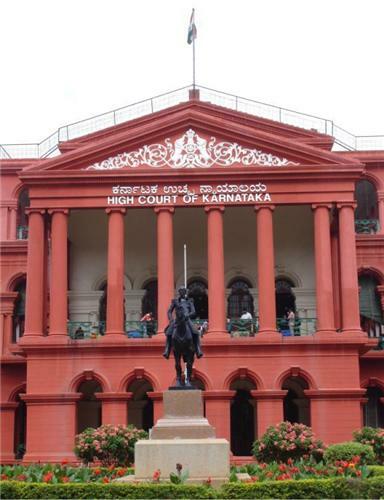 The Karnataka High Court, located in the state’s capital city Bangalore, is housed within the precincts of a famous red brick building, commonly known by the name of Attara Kacheri. This High Court is one among the 24 High Courts in India, set up to assist the Supreme Court – the apex judicial body of the country- in delivering justice to the aggrieved and providing legal solutions to their problems. In the Indian state of Karnataka, the High Court is present as the highest form of judiciary and, along with the district courts at the lower levels, is responsible for hearing cases that have either been referred to it by the lower courts or directly filed for its consideration. The article 141 of the Indian constitution bounds the High Court of Karnataka by the orders and judgements of the Supreme Court by precedence. The judges are appointed by none other than the respected President of the country. sir i want register case against my employee.pls help me .how i will register case againg him.